Located minutes from Winter Park and the ski resorts on 3/4 acre, with breathtaking views of 13,000 ft Byers peak. This Custom home was built for hosting groups and families. It has 5 bedrooms and 3 baths on 3 levels. It has 2 separate living areas so you can play games in one and enjoy a movie/music/conversation in another. Enjoy a glass of wine on the back deck while watching the sun set over the mountain peaks, then crank up the fire pit for a cozy fireside gathering. Take advantage of the fully-equipped media, audio center. Enjoy free WiFi. The kitchen also has everything you need to prepare that feast for your family and friends, with plenty of seating at the dining table, which expands to seat 10, while others sit at the kitchen bar. Walk 50 feet beyond the driveway to catch the free shuttle to the town of Winter Park as well as the ski resorts. There is plenty of off-street parking in the large horseshoe driveway. The surrounding area is a true Colorado gem, with over 600 miles of the best mountain biking and hiking trails. Walk to the fly fishing haven of the Fraser river or fish the headwaters of the Colorado River, just 25 miles away. Enjoy some of the country's most spectacular and challenging mountain golf courses. The winter is host to award-winning skiing and snow boarding at Mary Jane and Winter Park Resorts. The two areas spread across 5 mountains and 3,078 acres with 3,060 ft of vertical and an impressive 30 ft of snow per year. You can find terrain for everyone from the beginner to the most experienced adrenaline junky. Explore thousands of miles of snowmobile trails or make your own tracks in wide-open powder fields. You may choose from more exotic winter activities such as dog sledding and horse-drawn sleigh rides, to a tranquil, relaxing spa visit at Devil's Thumb Resort. Get excercise by snowshoeing or cross-country skiing. Our house is available for rent throughout the year. Call for availability and rates. We chose to build in the Winter Park area because we enjoyed visiting so much as children. We believe it is the last of the true 'Colorado Mountain Resort Towns'. It has just enough amenities to accommodate most interests, while maintaining a mountain town feel. As soon as we reach the top of Berthoud Pass and view the great continental divide and the Fraser Valley below, our stress is lifted. Smell the fresh mountain air, scented with pine trees and you will understand why we enjoy the area so much. We hope you will as well. Our house has the ideal layout for family and friends. It has 5 bedrooms and 3 bathrooms with 2 complete family rooms. This allows you to enjoy the company of larger groups without feeling cramped. We love knowing that our kids are having fun in the basement family room playing, watching movies or playing video games, while the adults enjoy time together on the main floor. Mornings are a treat as the sun illuminates the 13,000 ft., snow-capped, Byers Peak framed by the large windows in the back of the house. 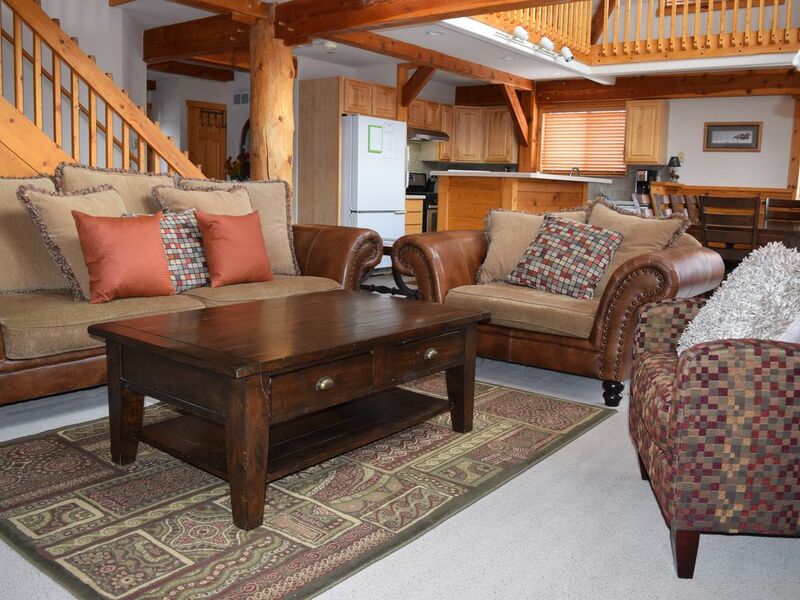 The vaulted great room is accented by large wood beams and logs, giving you the feel of a true mountain getaway. Plenty of space for 3 families. Will look for this place again next year. We truly enjoyed our stay. The house is well designed to host a large group. We had 7 and it worked out for all. Only thing that I would say was not so great was the TV did not work. Owner was responsive but never got it to work. But that is ok, it was not why we were there. Skiing was awesome. Recommendation is to add a hot tub. So glad you enjoyed your stay Jim. Although it may have been a little better if we were able to get the cable working. I spent an additional 30 minutes on the phone with Xfinity while at the house after you left and discovered that somehow the tv input was changed from cable to antenna. I changed it back and it now works. Sorry for the inconvenience. Please keep us in mind for future stays and I will provide you with a special offer. Everything as described, would recommend. Worked well for our family of eight adults including a grandpa and a fiancee. Everyone was able to have their own space - both for sleeping and hanging out. The kitchen table was great for card games. Depending on the traffic it took us about 12 minutes to get to the parking lot at Winter Park.Close to restaurants and very close to the grocery store. A great group property, great location and amenities! Our group of 8 arrived at different times for our recent ski stay. The door-lock code system worked seamlessly, so that was not an issue. I didn't personally use the wifi (thank God), but those who did encountered no issues. There were plenty of extra covers, blankets and throws for our large group. Our full group was able to sleep comfortably. I think that the advertised "sleeping 12" would apply only to groups with women and small children who might want to double up in the double beds and queens, but that wasn't an issue for us with our group of 8 men. The kitchen was well-equipped for all the basics. The unit was a mere 10-minute drive from the Winter Park parking lot, so very convenient. The damage deposit was refunded promptly and in full about a week after our trip. In all, we would definitely recommend this home for a large group stay, including perhaps one of our own in the future! Mark's place was great for a large group and convenient for skiing at Winter Park. It was very clean and spacious. We would stay there again!